I am going to make a start of blogging about the rest of our stay in England--and our trip to London and Paris. The whole thing that has been holding me up is that the pics are all on Larry's computer and I blog from mine. So today I put them all on cds and copied them onto my computer. Also I usually use picasa to upload and write from and it has been weird lately about not posting pics. We'll see what happens. These are a few pics from my mom's camera; I am very hopeful that she will post some herself but I decided to pirate these to use in the meantime. 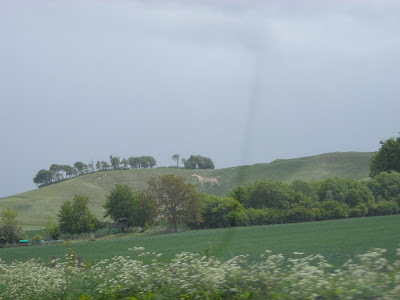 There are lots of chalk horses in the English countryside. 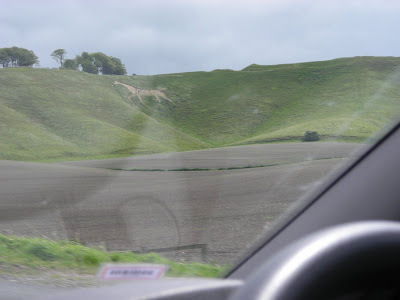 We didn't know this one was there until we happened to see it out the window on our way to Avebury. It's very cool! If you look closely ni this one you can see that there are people walking around on it, probably doing maintenance work. In the Victorian times they allowed this guy's um...bits to grow over with grass so as not to offend their sensibilities. He is now restored to his former glory, as you can see. And here's a family portrait in Avebury. 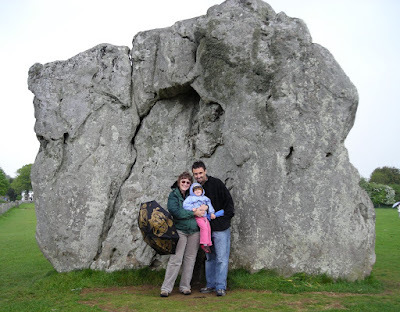 As you can see, the stones are huge and not as shaped as the ones at Stonhenge. Pundit Mom has a great entry today about choices as legislated by the supreme court. "Mama, can I have some sugar? Will you give me some lovin', please?" Hell yeah little girl, I'll give you all the loving you can take and probably some more after that. Cooking Gadgets has a casserole caddy that is totally brilliant. 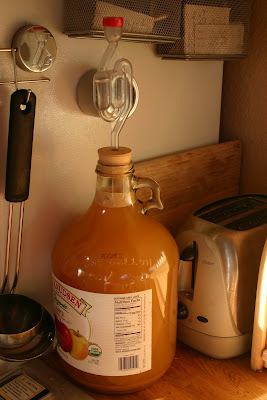 I bottled the hard apple cider tonight...it should be ready to refrigerate and drink tomorrow. Last Tuesday I got to see Michael Pollan speak at Revelle Forum at UCSD (the website where I registered for the forum cautioned to get there early so I was there a half an hour early with some magazines which I got to read for a full half hour, uninterrupted, it was heaven). I had read The Omnivore's Dilemma earlier this year after hearing about it on NPR and was profoundly affected by it, so much so that I developed a full-blown crush on Pollan (still crushing hard, by the way). But it wasn't until I saw Michael Pollan speak at the that I really GOT it. Until I read The Omnivore's Dilemma I had been smug and complacent in my belief that as long as I was eating organic, I was not only doing the right thing for my family, but also for the environment and animal welfare. But as Mr Pollan pointed out at the end of his lecture, there is really no "one" answer. The unfortunate answer is that in order to make sure we are eating the best quality food with the lowest cost to the planet, we have to read labels and do research. It can be exhausting. farmers are reengineering to tolerate corn. The eggs are made of corn. their working lives indoors tethered to machines, eating corn. can all be derived from corn. the cover of the magazine that catches your eye by the checkout: corn. has been built—is in no small measure a manifestation of corn. Having a monoculture is not good for national security; it's never good to put all of your eggs in one basket. The farm bill is not good for farmers. They should not be growing as much of a monocultural commodity crop as they possibly can for the lowest possible cost (they are often selling corn for less than it costs to grow it, then the government makes up some of the difference). Bovines should not eat corn (they literally can't digest corn and it makes them sick, which is one of the reasons both that they have to have antibiotics all the time and also why they emit greenhouse gases), they should eat grass. That seems like a no-brainer, doesn't it? But chances are you may never have even eaten meat or milk from a cow that wasn't mostly grain fed. Meat from non-pastured cows, it turns out, may be what is making us sick, not the cholesterol in the meat itself. Meat from pastured cattle is high in omega 3 fatty acids, meat from grain fed cattle is not (among many other ways that grain fed meats measure up poorly to grass fed). The "organic" label only means that the animal has only eaten organic feed and hasn't had hormones and antibiotics. It does nothing to address the horrific conditions under which animals are kept and slaughtered in this country. "Cage free" and "free range" only mean that the chicken was not in a battery cage. It does NOT mean that the chicken ever went outside, only that in most cases for the last two weeks of its life a small door was opened in the barn. Most chickens do not use it. Ethanol is NOT the answer. More corn? It seems on the face if it like it might be a good idea. But guess what is used to fertilize the corn? To refine it? To transport it? PETROLEUM. Ethanol uses more petroleum to produce than it saves. Pollan says that if the US used 100% of its corn crop to produce ethanol, it would replace 15% of the need for petroleum gas in this country. It may seem like the book is full of gloom and doom but the section where he talks about Polyface Farm is downright wonderful. This farmer has found a way to produce astounding amounts of "better than organic" meat and eggs, while leaving the land richer. This farm has animals that actually live the life that is pictured in the products of other companies. And the owner doesn't ship his product because that goes against his ideals about eating local and using petroleum to ship food to the ends of the earth. This is truly one of the best books I have ever read; I am positive that I am leaving out some major points but it's a start. If you like to think critically about where your food is coming from, you can't go wrong with this one. You can read the introduction and first chapter of the book here. 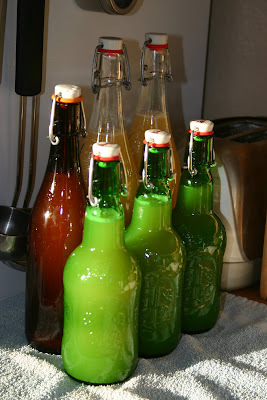 we're gonna have us some hooch. Father's day is always a bit strange for me. My father is alive but has chosen not to be in my life. Which is fine, really. He hasn't been much of a presence in my life since I was about 15, except as a reminder of how not to treat other people. It's hard because growing up he constituted half of the model I had for how to be and I hate it when I notice some aspect of his behavior coming out in me. He's not a bad guy, really. You'd probably really like him; he's charismatic and can tell stories and be really fun. But god forbid you need anything from him, especially accountability or stability. Or sobriety. Or a reliably gentle hand. It always seemed strange to me that a person would be able to act as if they had no children or, as my father does, only one, when in reality he has four. Three of whom have been burned too many times to come back to the flame. The other has another parent who is crazier than his dad and is too young to make a choice. Or maybe my father has changed and can be for the brother I have never met the father that he could not or would not do for me and my sister and brother. Now that I am a parent the choices that my father has made are unthinkable to me. As is the knowledge that my father knows he has a grandchild (two of them actually, and a step grandchild) that he has never seen. And the kicker is that last I heard he lived here in San Diego. I hope I never am in a place where I can empathize with that particular choice, the possibility scares me. Do I have it in me to turn my back on the flesh that I created as if she never existed? I sincerely hope not. Nina has another grandpa who truly believes that she hung the moon so she is not really missing out. And don't even get me started on what a FANTASTIC father Larry is. But that doesn't keep me from thinking about this stuff in unguarded moments. Way back in February Soccermom Jane challenged us to do more for the environment and I promised to start hanging my clothes out to dry. After all, it is sunny almost all the time here and there is no good reason I can't take advantage of that to conserve a little gas. 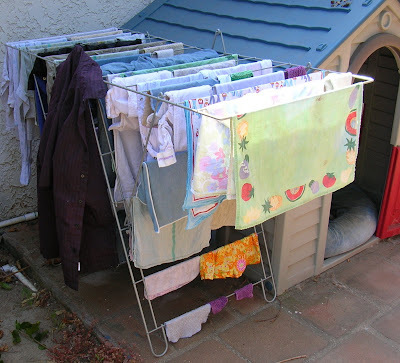 I really hate the feel of line-dried clothes so I will fluff them up for 15 minutes when they're done outside, but that's better than the hour they take to dry with no assistance from the sun. The drying rack I really wanted was this one from Gaiam, but at 89$ plus shipping, it seemed a little steep for right now. So I went to IKEA and got this one instead. It was under 20$ and is supposed to be ok to leave outside. One of my favorite meals to make is my special tilapia in coconut milk. It's super easy and quick but not very photogenic so I didn't take a pic. Chop the greens fine and put them in the bottom of an oven-safe dish that has a lid. I use a Le Creuset knockoff that I got at Target but whatever you have will be fine. It doesn't need to be super deep. Lay the fish on top of the greens. Mix the coconut milk, juice of the lemon, and sauce mix in a bowl with a whisk; pour over fish. Cover and bake about a half an hour. Serve with rice. For dessert tonight we had whipped cream and strawberries. 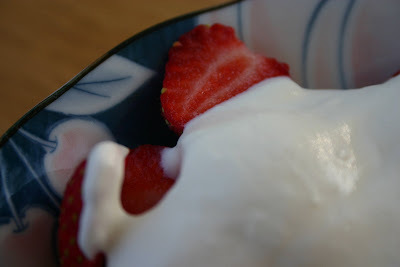 We had some strawberries left over from last week's CSA box and I also had some Organic Pastures raw cream that might not have been good in a day or two. So it was really the only thing to do. YAEDA VALLEY, Tanzania -- One of the last remaining tribes of hunter-gatherers on the planet is on the verge of vanishing into the modern world. One of my favorite sites, created by the lovely and talented Bonnie, was featured in a news story. We're back in San Diego now after a long, long couple of days of travel. I had a wonderful time. The best thing of all for me was that we were living just a few minutes walk from where I was working. Gone was mostly wasted time driving to work and gained was the chance to come home and have lunch with my family. Nina and I spent a lot of time at the zoo in Bristol and really enjoyed it. They have a wonderful lemur collection; Lorien showed one video from when we were in "Meet the Lemurs". You and the lemurs are in the same enclosed area - sometimes they want to hurry down the path and you kind of have to get out of their way. We also got to hear them talking to each other, which was a real treat. I think Nina will also remember hearing the mama lion roar - she was pretty scared. Bath is nearby and a lovely place. I read that some development is endangering its World Heritage Site status but it is a wonderful place to walk around. I reread "Persuasion" before and during our trip and was really happy to get to see bath. I wanted to go to Lyme as well but it would have been an extended train ride and there wasn't a good time to do it. Nina and I also visited the SS Great Britian. This is a 17th century steamship. I think it might have been the first one built entirely of iron (or else some other first) and it also was the first instance of an improved propeller design. They've got it setup in drydock so you can walk underneath and look at the hull. I don't think Nina enjoyed it as much as I did and the engines were incredibly loud, but it was really interesting to see the different classes of travel and read some stories about its trips. Work went well and I'm pleased to have had a chance to work on some things I probably wouldn't have done if I'd stayed here. Still, it's good to be back.